Traditional email addresses are generally limited to characters from the english alphabet, numbers and a set of special characters such as dots (.) and underscores (_). But what about all the international email addresses out there containing letters from other alphabets. Chinese, Japanese, Arabic. Or European languages such as German or Danish. 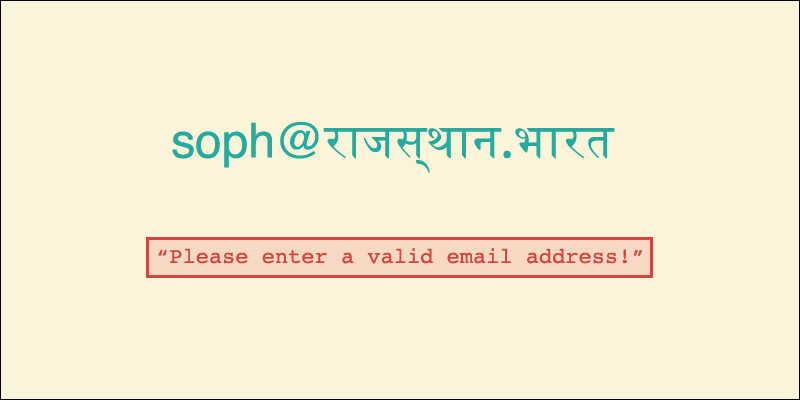 See the Pen Non International Email Validation by Andreas Wik (@andreaswik) on CodePen. See the Pen International Email Validation by Andreas Wik (@andreaswik) on CodePen. They all get through as they should! And non valid addresses such as billy@bullsh!t.com are still denied. Yay! Less users failing to sign up for your amazing service.